Arrendale Mobile+ is the smart phone app for Apple and Android devices. 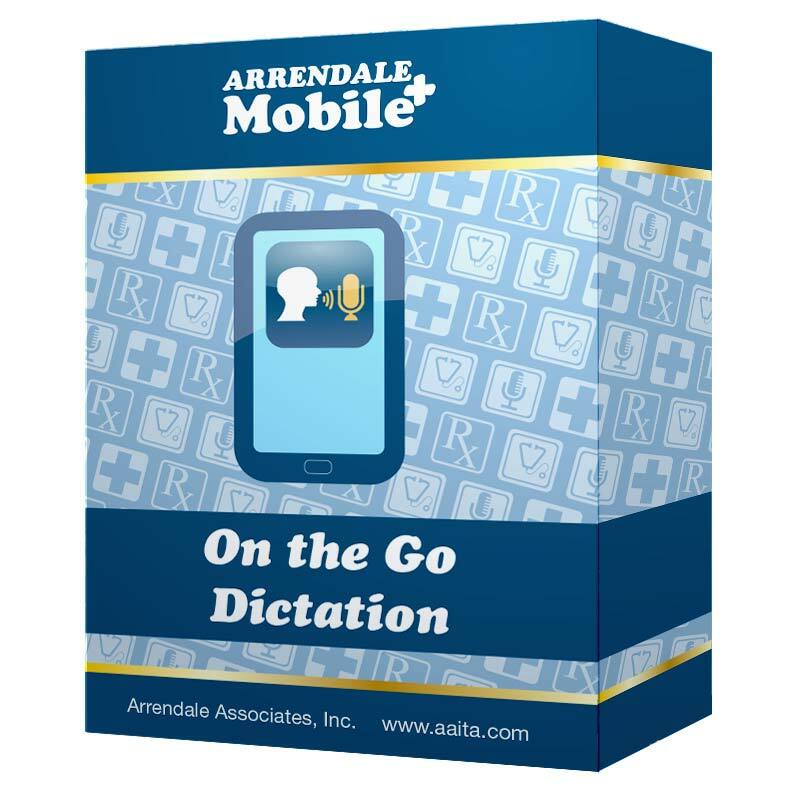 In addition to fully featured dictation, Mobile+ functionality includes viewing prior transcripts, searching for patients and the convenience of e-signature. Providers no longer need to carry a separate expensive recording device. Mobile+ even integrates with Dragon and Speak-EZ+ for speech recognition timesavings. Mobile+ is a convenient, reliable dictation app for cell phones and tablets with intuitive screen displays. The History screen lists jobs by sent date and the e-Sign screen enables rapid transcript signing after viewing on the device. Dictation modes include Record, Stop, Rewind, Fast Forward, Insert and Overwrite actions. No training sessions are required; our Quick Start Guide directs new Mobile+ users through the straightforward screens. With the addition of Arrendale’s Speak-EZ+ and Nuance’s Dragon MPE2, providers gain speech recognition efficiency, see the TA+ Bundle description. Providers using the Mobile+ app without an interface create Free Form dictations, narrating patient meta data for each encounter. Mobile+ includes a Stat button to prioritize a job ahead of other dictations. Mobile+ contains a Save Incomplete status for storing partial narratives for completion later. Mobile+’s Advanced Search enables providers to locate and view previously archived transcripts from the remote TA+ server. With Mobile+ providers may create multiple dictations on the same patient throughout the day. When an interface exists, the Mobile+ Home screen color codes each patient on the daily list, alerting providers which patient notes have or have not been completed. Mobile+ allows providers to send a note to the transcription staff when changes are needed before e-Signing. All dictations from Mobile+ are sent as smart phone files, producing higher clarity for more accurate documentation. When providers dictate into a smart phone by dialing a dictation system the results often include static, cut off words and poor audio quality; Mobile+ eliminates these problems. Mobile+ benefits physician practices, hospitals and single providers and others needing to dictate ‘On the Go’. Mobile+ includes HIPAA safeguards throughout the app protecting all patient data, transcripts and dictation voice files. Passwords are required for all functionality. Manual log offs and forced log offs due to inactivity remove all data, transcripts and dictations from the device. All transmissions are secure with HTTPS and SSL encryption via wireless networks rather than using cell phone minutes. Mobile+ is downloaded from the Apple or Google Play store. Mobile+ is activated by calling the Arrendale Support Center, 800 344-1323, option 1 for a configuration variable. An interface, csv import or HL7, is not included with the Mobile+ license, but may be purchased separately. Customer Support is available by calling 800.344.1323, option 1. Users may access their Mobile+ app from multiple devices under one license. Mobile+ is a module of the Transcript Advantage Plus clinical documentation platform which includes several voice input options, word processing software, speech recognition, a document repository, quality assurance workflow, e-signature, automated transcript distribution, interface capabilities, statistical reporting and event logs for HIPAA. Providers may elect to contract with A+Network Transcription, LLC to have their Mobile+ voice files transcribed by the A+Network US work force; call 888.880.4359 for details. Support is included for the first 120 days. Support is available thereafter at $29.99 per year per license. Annual Support entitles users to toll-free telephone, email and remote desktop support from the US based 24 by 7 Arrendale Support Center.